I have quite a bit of catching up to do with posting photos, as some of these were taken almost a month ago. We've been enjoying these 80 degree days, and we certainly aren't ready for July to be over yet! This past week, we celebrated Steve's 30th and his Grandma's 99th. We've picked veggies from our garden, roasted marshmallows, splashed around in the backyard, and even got to cool off in the movie theater. Here's to savoring these mid-summer days! Take a peek. . . Pool fun with friends. I had to drag Nolan away from the water after three hours :) He's my little fishy. This was the closest Ephraim got to the water - sticking the shark into the fountain. He'll learn to love the pool, I hope! 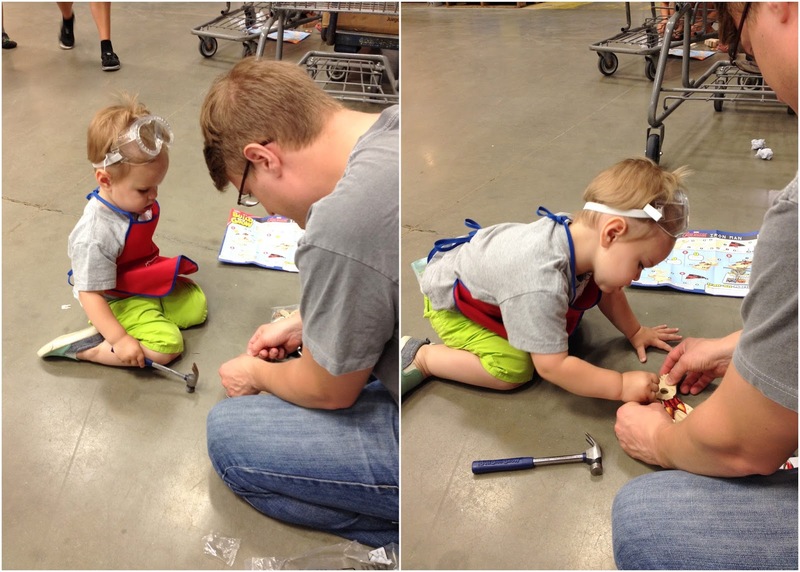 Making Iron Man at Lowe's. The Build and Grow workshops have been all about the Avengers this summer. We've made three of them so far, and there are three left (tomorrow is Thor). Ephraim is getting really into it! And pulling on the giant school bell. We ate scoops of ice cream and lemon ice around the fire, and it was one of my favorite summer nights to date. We had a MOPS playdate at the airport in our town. It's a tiny airport out in the country, and it only flies to one city, so Nolan didn't even know we had an airport here. 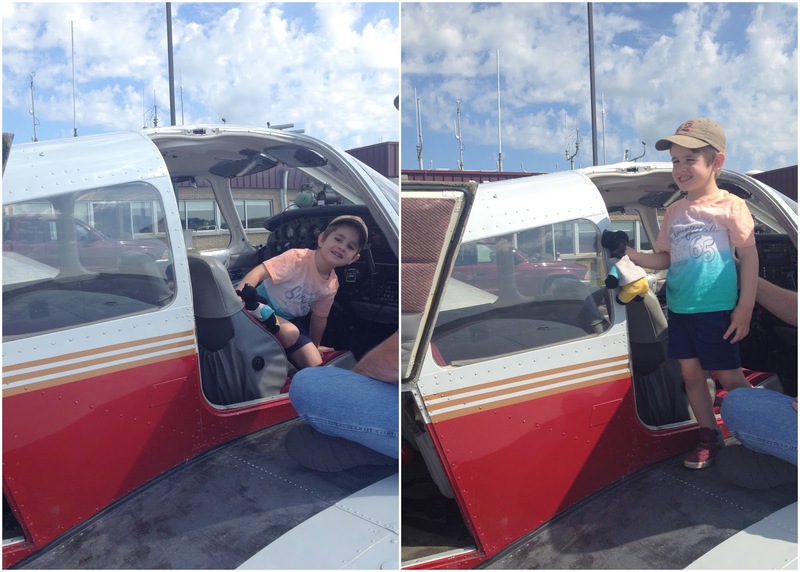 We got to take a look inside my friend's dad's plane, and some of the kids even went up in the air! Watching the airport fire truck spray water. We haven't been on a plane since Nolan was 1, so this was a really cool experience for them! Nolan had his first swimming lessons! The first day, he spent a few minutes doing what the teacher asked, and then he burst into tears and wouldn't go back in the pool. Here on the last day, all of the kids are participating in the circle, and my kid is on the wall still. We'll try again next year! I'm obsessed with s'mores in the summer! Our friends Chas and Amber got married a couple of weeks ago, and they had a beautiful wedding! The reception was at the country club, and it was nice to be just Steve and Rachel for a few hours. I updated our mantel for the 4th of July, and now I'm ready to think of a new theme for the end of summer/beginning of the school year. Last week, my MOPS group had a playdate at the state park where the kids could go swimming in the lake. Nolan and Ephraim were a little intimidated at first, but by the end, I couldn't get them out of the water to go home! Isn't the background beautiful!? Messy beach hair, pink cheeks, and the cutest little "cheese". Last Friday, we made a trip to see Steve's Grandma Olive on her 99th birthday! We had a small party for her in the outdoor courtyard of the nursing home. Olive is always very happy and humble. She really is a remarkable lady! The raspberries in our backyard have been going strong, and I am eating them as fast as I pick them! Ephraim keeps stealing my phone because he figured out how to turn it on and take pictures. He snapped this one of me petting Ivy one morning, and I think it turned out really cute. And Steve turned THIRTY on Tuesday!! We celebrated with a chocolate chip caramel oatmeal cake. The boys and I gave him thirty gifts/coupons to redeem this year. 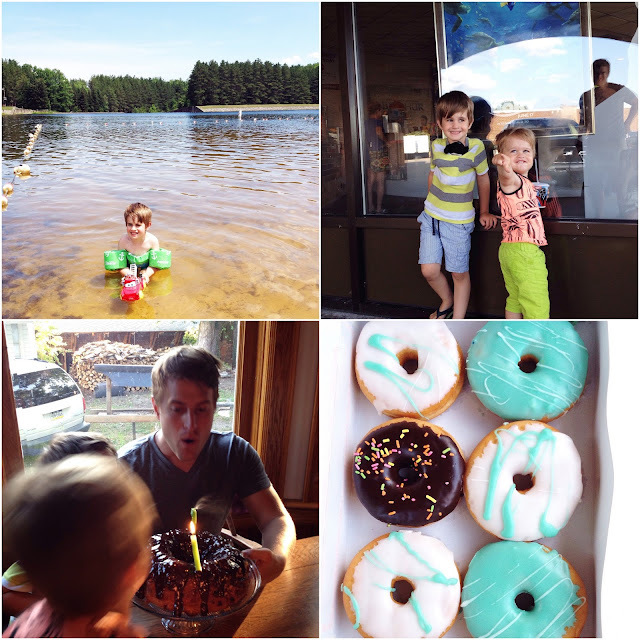 It was fun to spoil our favorite guy! Thanks for catching up with us. :) Stay cool this weekend! 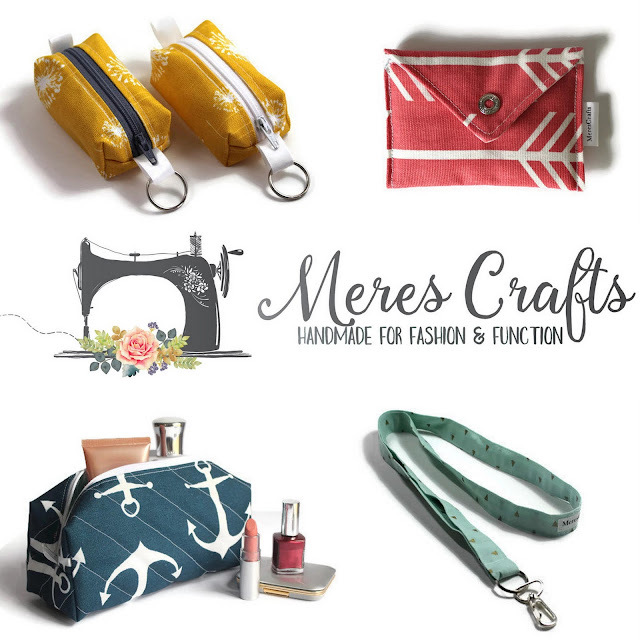 Today, I want to give a shout-out to one of my favorite Etsy shops, MeresCrafts. Meredith sent me two of the prettiest makeup bags in a blue and white Aztec print. She does such high-quality work, and these bags are flawless. The medium bag is 8 inches long, and the small one is about 5 inches long, so they are both great sizes for travel cosmetic cases, or for sticking in a purse or diaper bag to stay more organized. Wouldn't they be a cute bridesmaid gift or birthday gift for any gal in your life? Meredith can do monograms on the bags as well. To receive 10% off of your first purchase, use the code BLOG10!